The US economy is one of the front-runners in the global automation race. 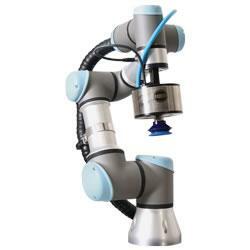 By 2018, the number of industrial robots sold to 2018 will, on average, rise by at least five percent per annum, to a new record of 31,000 units (2014: 26,202). Mouser Electronics will be a major sponsor of this week's FIRST Robotics Competition Dallas Regional event occurring March 24-26 at the Irving Convention Center. The annual robotics event, which fosters STEM education, attracts hundreds of high school students from across the area. STARTUP WORLD - part of the AUTOMATICA 2016 trade fair in Munich, Germany - will offer thriving startup companies active in industry automation and service robotics the opportunity to present at a leading international exhibition. 03/21/16, 01:32 PM | Industrial Robotics, Factory Automation | ABB Inc.
03/21/16, 01:31 PM | Industrial Robotics, Factory Automation | Dorner Mfg. Corp.
For manufacturers who rely on CNC machines, they know that servo motors are one of the first components to break down. Electric Enterprise offer one of the industries fastest turnaround times with 24hr repair.